All titles are available in good assorted record shops or from FARAO Classic (Munich), ELMO Ltd. Japan, OSMUN Brass & ONANDAGA inthe USA, PAXMAN in GB, DISCANTICA in Milano Italy or by direct order via email, fax or voice. To know more about their products, like Haendel's "Xerse" or J.S.Bach's "Weihnachtsoratorium" under Enoch zu Guttenberg direction, a recording of "Die Walkuere" live from the State Opera in Munich, Zubin Mehta conducting, G.Mahler: Symphony no.3 live rec. at Musikverein in Vienna, Mehta conducting Bavarian State Orchestra, etc. All prices are recommended list prices without the local VAT, which must be added to the prices. As the picture quality has been improved, resulting in larger files, the loading process for the pictures might take a few seconds longer. Be patient. MP3 samples of all seven CDs will be available on this site very soon. 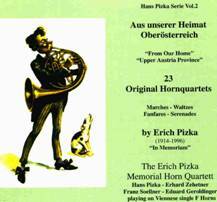 This CD is a homage to the late horn professor Erich Pizka, who's 23 original horn quartets are recorded here for the first time. 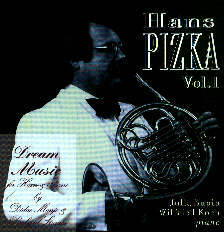 His three former pupils & his son play all the waltzes, marches, polkas & serenades on their single F Viennese horns with the traditional rich horn sound. 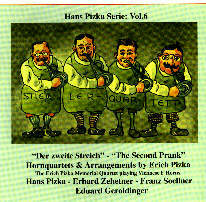 All four players speaking the same local dialect, playing the same instruments, having studied with the same teachers. 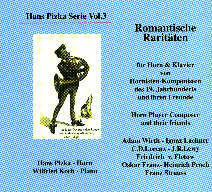 "Romantische Raritäten" - Rare Romantic Pieces by horn playing composers & their friend from the 19th century: Adam Wirth, Ignaz Lachner, C.D.Lorenz, J.R.Lewy, Friedrich von Flotow, Oskar Franz & Franz Strauss.--Wilfried Koch (piano) & Hans Pizka (horn - Ganter full double F/Bb, Viennese narrow bore) . -Hans Pizka recorded these ten romantic and virtuoso pieces within two short sessions using his Viennese bore Ganter F/Bb double horn. Some of these pieces will surely find their way into the horn players repertory, as they demonstrate beauty of tone, classical horn technique & beautiful music. 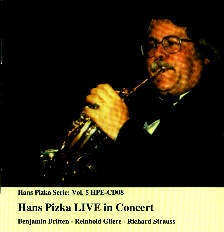 "Hans Pizka LIVE in Concert"
LIVE recordings have come into fashion as they provide more atmosphere than studio recordings. So say the reviewers. Elder recordings cannot be expected to be perfect as with 1997 equipment. 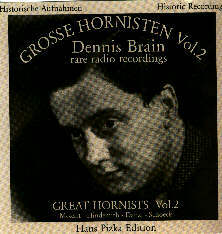 R.Strauss' horn concerto no.2 was still a big bite for most orchestras. 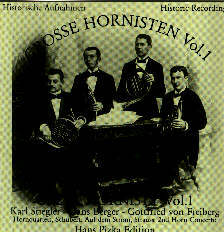 Nevertheless, the sound of the single F horn is worth listening as it is the only recording of this concerto by a former student of the first performer. Britten's Serenade op.31 and Gliere's Concerto op.91 were recorded with 1997 equipment and are unedited as in the concert.